The HP TouchPad 32GB Wi-Fi tablet computer stands out from the crowd with its own unique take on how a tablet should work and perform. Its innovative touch technology makes sharing content between your smartphone and tablet easier than ever, while the new webOS operating system is designed to run multiple applications, sync contacts and browse the internet in a completely fuss-free way. Whether you want to work on an office-based task, contact friends, family and colleagues or sit back and watch a film, the HP TouchPad has you covered. And it all comes to life on the TouchPad’s large, bright and beautiful LED 9.7” screen. The HP TouchPad 32GB Wi-Fi tablet is the perfect companion for long journeys by plane, train or car and lazy days by the pool or in the garden. On these occasions, when you’re probably going to need some entertainment, the HP TouchPad is ideal. Its vibrant screen is fantastic for movies that you’ve loaded up onto the tablet’s 32GB hard-drive, while its multi-touch display makes it a breeze to navigate around the web, play games and use applications. The screen also features IPS wide-view technology, so you can see all of the on-screen action even when you’re viewing it from an angle. Of course, the ultimate movie experience on the move relies on sound-quality as well, and the HP TouchPad has that looked after too, with Beats Audio built in to give your film’s soundtrack and music a powerful boost. If you want to get more involved with the action, you can download games onto the HP TouchPad over a Wi-Fi network and dive into the action, with amazing graphics and fluid gameplay brought to the tablet by powerful Qualcomm Adreno 220 graphics processing. With such high levels of audio and visual quality on the HP TouchPad you can really get lost in your entertainment – just don’t miss your stop. If you want to take a look at your favourite sites, you can see them exactly how they’d appear on your desktop computer thanks to the HP TouchPad’s full-support for Adobe Flash content. This means that videos and moving images will all appear on the tablet’s screen so you can enjoy everything that your websites have to offer. And you won’t have to wait long to access the sites that you love most, with a super-speedy 1.2GHz Snapdragon dual-core processor opening up content-rich websites in a matter of seconds. One of the most impressive features on the HP TouchPad is its touch technology, which allows you to simply touch your HP Pre 3 smartphone against the tablet to share content between the two. So, for example, you can view a site on the HP TouchPad and then touch it against the Pre 3 to transfer the content to your smartphone. You can then view this page on your smartphone offline later on, without eating into any of your 3G data plan. This touch technology also means that you can tether the two devices together and use the Pre 3’s 3G data network to browse the web when you’re not connected to a Wi-Fi network. The two devices work seamlessly together, even allowing you to answer the phone via the tablet and see text messages on the smartphone and tablet. Overall, the HP Pre 3 smartphone adds additional functionality to the already impressive HP TouchPad. 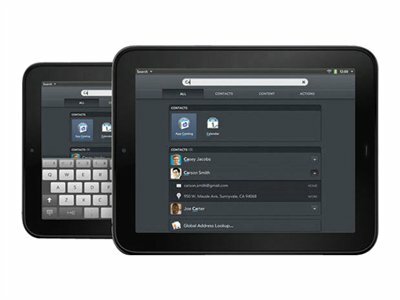 The tablet runs off the new webOS operating system, which has been built from scratch to make it easy to operate your tablet. WebOS allows you to open up multiple windows, stack them together and open and close them in a similar way to how you’d work with multiple tabs on a PC. Your web pages and applications run in the background even when you’re viewing or working on something else, so you’re constantly kept updated. Applications can be downloaded from the webOS store, allowing you to customise your device exactly how you like.